Tired of having his stadium look deserted on matchdays, the general manager of Serie B side Triestina has taken drastic steps to flesh out the attendance at the club’s 32,454-capacity Stadio Nereo Rocco by filling the empty seats with fake fans. 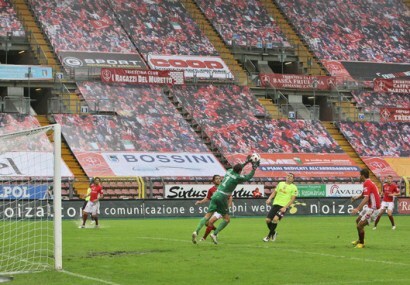 Ahead of last Saturday’s home game against Padova, Triestina GM Marco Cernaz had a series of huge vinyl posters stretched across 10,000 vacant seats, depicting a thronging mass of supporters in the stand opposite the television cameras. “We’d love to have a full stadium with real supporters and we’ve done everything we can to get people through the gates, but the reality is that we can’t. It’s not quite as dumb as it first appears as, as the club continues to battle against a slump in their attendances, the “virtual crowd” serves as a fairly ingenious stream of advertising revenue, with companies paying to display their logos on the fake terrace. Triestina also claim that they are saving a fair old wodge of cash by not needing as much insurance on matchday, as well as halving the number of stewards and medical staff they need on hand. It’s quite an old story but it sounds great! @Alex: Oh dear, someone Tweeted us the link this morning and I made the rookie mistake of not checking the date. Failissimo. @Chris: It sounds great anyway. It’s an epic story. Highbury had this over 20 years ago when the clock end was getting fixed up so this is fairly current footballing journalism in comparison.